Earlier this year at, Marrybrown fast-food restaurants from Malaysia to give a special promotion to the community and student Batam with member card free labeled vilage cards and student cards. No special conditions for both these cards. "Consumers simply came to ask Marrybrown and our waiter. Vilage Card For Free, marrybrown give discounts of 10 percent. As for the Student Card, must show student card, and there was food in the package offered at a price of Rp15 ribu tax included, and can use the card repeatedly, over a year, "said Budi Arisandi" Marrybrown Manager. Not only is it, to spoil the Batam City, every Saturday and Sunday, officers will also visit Marrybrown housing to offer this promo. "So apart can come straight here (Marrybrown), the community will also meet with our staff we offer this promo from house to house," he explained. Moreover, for those of you who like to play in cyberspace, in the Marrybrown also provide Hot Spot facility provided free of charge. Marrybrown fore a few days spread over several countries will also be launching a value milk. "Every book listed in this menu, customers will get a free capuccino Hot. We are also currently being given promotion deals given the hot rice, the food menu is offered at a price of Rp10 ribu," he said with a smile. Eating places are located in these countries were deliberately designed differently. Special dinner there is a place with a bench swing to relax, even there is also a play area (play ground) specially equipped with games such as bathing and slide the ball to be enjoyed by the children. 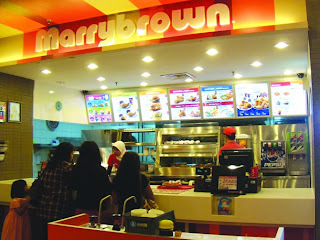 For those of you who are curious can visit Marrybrown immediately in the ground floor Mega Mall, Batamcentre.